November 14, 2017 — Dr. Kenneth Rubin, gastroenterologist and director of the Inflammatory Bowel Disease Center at Englewood Hospital and Medical Center, has earned Advancement to Fellowship with the American College of Gastroenterology, and was recognized in October as one of the 50 most influential volunteers in the history of the Crohn’s and Colitis Foundation’s New Jersey Chapter. To obtain fellowship, members must show maintenance of educational status by attending ACG meetings regularly, and evidence of professional leadership in the fields of clinical practice and/or academic medicine, often by presenting publications at the ACG meetings. Endorsement by two fellows of the College is also required. Rubin said his advancement is an honor, calling ACG “the most well-regarded clinical organization for gastroenterologists across the United States,” many of whom he met with at the College’s Annual Business Meeting in Orlando, Fla., where he received congratulations from ACG President Dr. Carol A. Burke. While in Orlando, Rubin also attended the World Congress of Gastroenterology, a combined meeting with the ACG that welcomes gastroenterologists from all over the world to join and present from unique perspectives. Rubin’s involvement in the field began with a two-year fellowship in gastroenterology at Mount Sinai Hospital in New York City, where Dr. Burrill B. Crohn was the first to identify and describe Crohn’s disease. 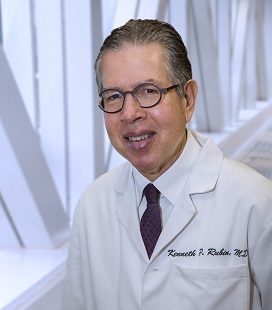 After his initial training, Rubin stayed on to teach as a full-time faculty member at Mount Sinai for one year, working closely with Dr. Henry Janowitz (who took over Burrill’s practice) and Dr. David Sachar, before going into private practice in Englewood. He continues to teach as a clinical assistant professor of medicine in the division of gastroenterology at Mount Sinai, several months a year. In honor of the Foundation’s 50th anniversary, Rubin has been named among the top 50 volunteers in the history of the New Jersey Chapter. “As a valued partner in our chapter’s history, Dr. Rubin has committed to helping the Foundation find a cure for Crohn’s Disease and ulcerative colitis and to improving quality of life for his patients affected by these devastating diseases,” said New Jersey Chapter Executive Director Rosemarie Golombos. Rubin was recognized in October at the chapter’s “50 & Fighting” event, a celebration including food, themed cocktails, dancing, and words from the evening’s honorees and patient speaker. “Fifty is a relatively small number, so I’m actually quite honored,” he said. For more information about the American College of Gastroenterology, visit www.gi.org. For more information about the Crohn’s & Colitis Foundation of America, visit www.crohnscolitisfoundation.org.